The 'Bird is back: a great single-cut for players on a real-world budget. Clean build; light in weight for its style; classic jazz/blues/ rock sonic palette. Limited colour choice; less vintage-specific than other Newark St Guilds. The genesis of the Bluesbird goes back to 1954 when fledgling New York-based Guild Guitars released its first original design, the Aristocrat M-75 - a down-sized jazz box with a sealed top and classed by Guild as a "lightweight, semi-solid midget model... in a class by itself ". The 'M' of its name, incidentally, stood for midget. It lasted until 1963 but reappeared as just the M-75 in 1967, and by '68 it was coined the Bluesbird M-75, the name suggested by Louis Dronge (younger brother of Guild founder, Alfred Dronge, and Guild sales rep in the New England area), who, according to Guild Guitar Book author Hans Moust, had noticed that the original Aristocrat M-75 had become popular with blues players in the Boston area. While the original Aristocrat had featured dual 'Frequency Tested' P-90-style single coils, this first Bluesbird sported Guild's small humbuckers, a new headstock shape and a stair-step pickguard. It was discontinued in 1972, two years after a solidbody version, the Bluesbird M-75 CS (in chrome with rosewood fingerboard), and GS (gold-plated with an ebony 'board) versions had appeared with Guild's larger humbuckers, a distinct German- made roller saddle AdjustoMatic bridge and slanted-block string anchor. A more Les Paul-looking semi-solid Nightbird appeared in 1985, but the Bluesbird didn't make a comeback until over a decade later when the then-Fender-owned brand released a high-ticket USA-made Bluesbird, modelled seemingly on the Nightbird rather than the original M-75 shape. This new guitar was joined by various M-75-alikes that retained the original shape in the Korean-made DeArmond by Guild line. It holds its own in such illustrious, higher-priced company and, in its own right, serves across the board. By the end of that decade, those had pretty much gone and the trail goes dead until the new Guild Newark St Collection, which was conceived by Fender and continued by new owners Cordoba. Within this collection was a reissued close clone of the original Aristocrat: the M-75 Aristocrat (introduced in 2013), a cool-enough retro piece, but as anyone who's played one will agree, it doesn't sound like Gibson's finest! Which is where our new Bluesbird comes in: less of a vintage repro and more like that first Fender-era semi-solid Bluesbird in style and construction. It might be less vintage-specific than the current M-75 Aristocrat, but it still retains Guild's original take on the Les Paul outline with its broader lower body and rounded horn. We get the 'centre-raised' Guild headstock with its Chesterfield logo, but those and the transparent G-logo control knobs are the only real Guild appointments. There's no pickguard, the bridge and tailpiece are Gibson- style parts, albeit of Tone Pros' excellent locking variety, and Seymour Duncan's JB and '59 (with pull/push coil-splits on the tone controls) replace Guild's own humbuckers. is 40mm at the rim with an overall depth of 49mm. The Aristocrat is completely hollow with dual longitudinal top braces and a braced back, whereas the Bluesbird has a solid centre block and hollow sides with a flame maple veneered carved top (a Jet Black version is also offered), consequently making the Aristocrat lighter at 2.5kg (5.5lb), while the far-from- heavy Bluesbird weighs in at 2.98kg (6.56lb). If the Bluesbird looks modern compared with the Aristocrat, especially in this Ice Tea Burst, the weight makes it immediately engaging. Strapped on, not surprisingly, it feels more solidbody, with an expected lower acoustic volume. The neck shape is a little thinner depth'd than any of our other modern Guilds, too: the Aristocrat measures 21.5mm at the 1st fret, 23.8mm at the 12th; the 'Bird measures 20.8mm at the 1st and 22.8mm at the 12th - which is enough to make a difference. The new Bluesbird has less of a vintage repro and is more like that first Fender-era semi- solid Bluesbird in style and construction. And although the scale length, fingerboard camber and frets all seem pretty similar, the modernism of the 'Bird is again highlighted by its clean mother-of-pearl block inlays compared with less tidily inlaid aged-pearloid blocks of the Aristocrat. Still, the new 'Bird plays exceptionally well. The pretty tall medium jumbo wire is effortless for bending, intonation is spot-on and there's a quality to the feel - like PRS's SEs, for example - that punches above its price. The premium-choice pickups drop us right into classic blues/rock territory. The '59 at the neck nails a hugely usable PAF-alike voice that's not overly spikey and very vocal with some gain boost. There's a strong upper-mid grunt to the bridge JB that, again, really begins to earn its money with some light to medium gains. The coil-splits are a surprise - they're not mentioned on Guild's info page - and voice the slug single coils. As ever, add a bit of air into a body and it becomes arguably harder than a solidbody to pigeonhole. Compared with our reference PRS Singlecut, it's lighter and brighter; compared with an ES-335, it doesn't quite match the depth and fruitiness of the neck pickup, but has a more rock kick from the bridge; it's not as smoky as a Knaggs Chena... and on it goes. But, to be fair, it holds its own in such illustrious, higher-priced company and in its own right serves across the board: a good jazzer, albeit a little less evocative and hollowbody-sounding as the M75 Aristocrat, which then leans easily into more gained fusion, and does a pretty good brighter and snappier Les Paul without the physical weight. The coil-splits can sound a little thin in direct comparison with the full 'buckers, but they certainly expand the voices and, if you use your volumes and tones, add useful textures. One one hand, the more generic style of this new Bluesbird makes it dangerously close to being yet another single-cut, and although those USA parts (Seymour Duncan and Tone Pros) are a draw, they're also the very same that we see on numerous other brands. 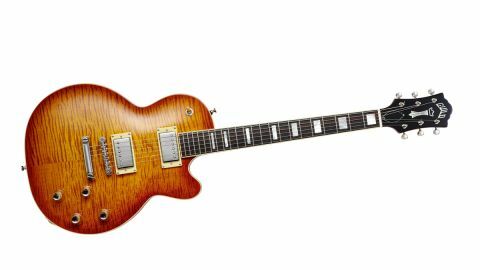 Conversely, it's another extremely nicely made and great-sounding single-cut with that added bonus of the chambered body, which affects not only the instrument's weight (the age-old problem with the beloved Les Paul), but also its resonance.